Click here to first learn how to create your Studio Packages. Then you will be ready to sell the packages to your clients, as per the steps in this article. Selling the package to the client. Add your client to POS and click the Add Items link. In the pop up window click the Package button. 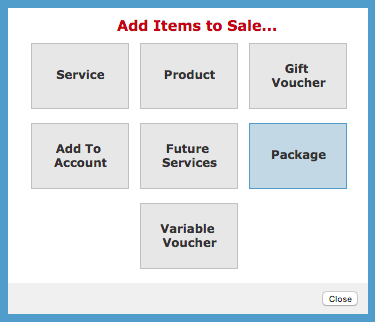 On the right side panel select the desired package from the menus, and Save. The Package will be added to the clients sale for you to Receive Payment, select payment type and Finish Sale. Making appointments for pre-paid services, which are a part of a pre-paid package. Once you have sold the package to your client, you can book in their pre-paid services. Go to the client'sclient card and in the Visits section click Packages. As you can see the status is Pending for each of the pre-paid services, they are yet to be booked in and redeemed. To book one in, click the Lock In next to it link and you will taken across to your Appointments diary. 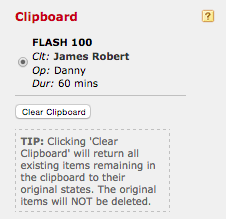 The Clipboard (on the right side panel) is holding onto the service while you navigate your way around the Appointment page until you settle on the day you wish to book the appointment for. Once you find your day, using the calendar icon in Appointments, simply click the time slot you wish to book the service into. The appointment will booked in and will automatically turn grey to indicate that it has already been paid for. Another way to redeem pre-paid services which are a part of a package. There is one other way to redeem services which are a part of the clients pre-paid package. You can simply make the appointment for the service directly into the Appointments book. Click the clients name, Add Client To Sale and you'll notice a yellow star come up next to the price of any services which are already pre-paid as part of the clients package. 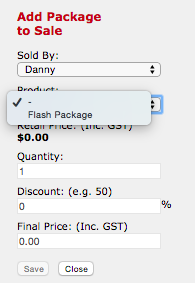 Click the yellow star next to the price and redeem as part of the package. The service will disappear from POS as it has already been paid for. You're done! Go ahead and start selling your packages. Clients love a package, use this functionality to generate more business. NOTE: If the client also has products to redeem, which are part of their pre-paid package. Simply go to their client card and in the Products section click Collect next to the product.